My husband often complains that I don't talk loud enough. If I'm not facing him, he can't hear what I say. And maybe I do mumble some - and talk to him as I walk away. But I still want him to hear. So that's what counts, right? If we want someone to hear what we have to say, we need more than intentions. We need more than to want folks to hear what we have to say. We need to take steps to make sure they can hear us. We need to be sure we're speaking the same language. We need to get their attention, and impress on them the importance of what we're telling them. Otherwise, all that talking will be for naught. And what can we say that is more important than God's message to us - His message of hope, and His message of judgement? I want to tell unbelievers about the salvation, hope, and peace they can have in Christ Jesus - and the disastrous results that can occur if they aren't in Him. But if I mumble, or talk to the wall, my wanting won't do a thing. If I stand in the middle of a noisy, crowded room and share Jesus in an "inside voice," I might as well have kept my mouth shut. If my message is important, I need to make sure I'm heard. So I raise my voice. I "blow the trumpet." I "sound the alarm. "I "put it on a stand." And THEN I share my news - His news. And people will hear me. Thanks for reading! Be sure to stop by Vonnie's blog for more Monday Manna. 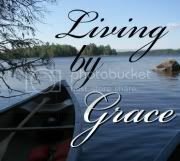 AND hop over to Living by Grace to discuss this post. Great reminder, Joanne! The Lord has entrusted us with His gospel message - your post really challenges me to speak up and speak clearly so others WILL hear! Wonderful post! I have a voice that really carries–ideal for seniors' meetings! People hear me whatever I say so I'd better be saying the best things! Intentions are not enough. As much as I like to think they are, they aren't.